Adobe on Wednesday revealed its latest update to Creative Cloud, which comes with 14 new versions of CC desktop apps, as well as four new mobile apps and the official launch of the company's stylus and ruler set for iPad. With more than 2.3 million active subscriptions worldwide, Adobe's Creative Cloud is one of the most successful media creation suites available. For 2014, the company is primed to hold its biggest software release since Creative Suite 6. "Our shift to Creative Cloud has given us a broad canvas on which to innovate like never before," said Adobe's senior vice president of digital media David Wadhwani. "We've taken bold steps with this milestone release, fast-tracking new features to industry-defining tools like Photoshop and InDesign, while introducing mobile apps that turn tablets into indispensable creative tools." For the desktop, Creative Cloud subscribers will be granted access to 14 revised apps including Photoshop CC, Illustrator CC and InDesign CC. Spotlight features for Photoshop include a Blur Gallery that quickly generates motion effects for a sense of movement in still images, Focus Mask for tweaking depth of field and new Content-Aware capabilities. Other enhancements include a buffed Mercury Graphics Engine, improved Layer Comps and the ability to link Smart Objects across multiple documents. Illustrator now features Live Shapes, while Web tools like Dreamweaver CC include a new Element Quick View that lets users easily view markups in a document. 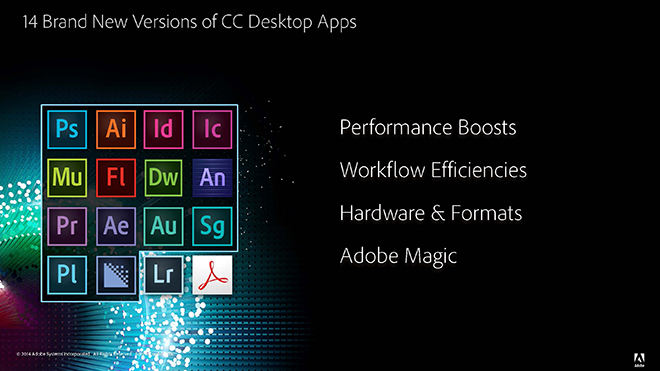 For a complete rundown of the new apps, visit Adobe's dedicated Creative Cloud webpage. Adobe is extending its reach into mobile with four new apps and a set of hardware accessories tailored specifically for Apple's iPad. Line is what Adobe claims to be the first iPad app for precision drawing and drafting. The app can connect with Adobe Slide hardware to draw curves, lines and perfect shapes in various views like elevation or perspective. On the photography side, Lightroom for iPhone and Photoshop Mix bring powerful image editing to Apple's iOS devices. Lightroom for mobile was already introduced for iPad in April and now Adobe shrunk down the experience for iPhone. Photoshop Mix for iPad offers compositing and masking tools, as well as cloud-enabled features like content-aware fill and image straightening. Finally, Adobe Sketch is a simple free form drawing app that comes with a digital pencil, pen, blending markers and an eraser. A standalone Creative Cloud iOS app is also being offered for file management and mobile account access. Adobe's Ink and Slide iPad accessories. 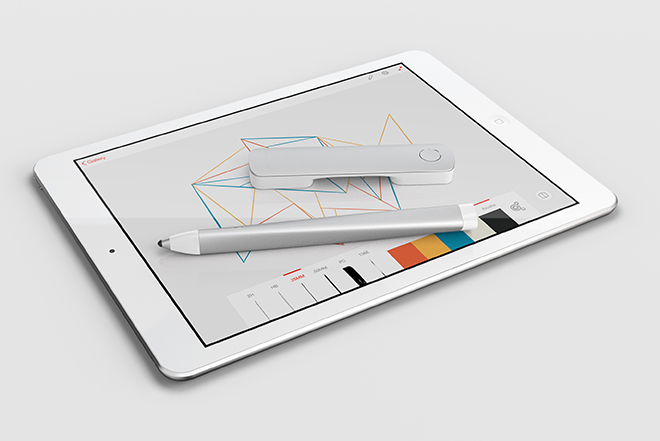 As for Adobe's foray into iPad hardware, the company introduced Adobe Ink and Adobe Slide, a stylus and ruler set based on the Project Mighty and Napoleon prototype models. Adobe Ink is a hydro-formed aluminum stylus that uses Adonit Pixelpoint technology to offer pressure sensitive input in a lightweight unit. 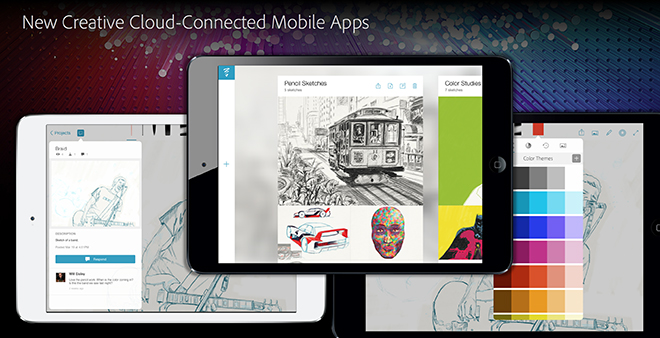 The device connects to Creative Cloud to offer users access to drawings, photos and Adobe Kuler themes, along with other assets. Adobe Slide is a companion to the Ink stylus that enables the drawing of precise straight lines, circles and other shapes. The new Creative Cloud Photography Plan is priced at $9.99 per month and includes Photoshop CC and Lightroom, as well as access to the mobile Photoshop Mix. In addition, Adobe slashed $10 off the Creative Cloud Student and Teacher Edition subscription price, which now goes for $19.99 per month. Adobe Line, Photoshop Mix, Lightroom for iPhone and Creative Cloud for iPad and iPhone are all free apps available through the iOS App Store. A subscription is required for syncing and certain operations depending on the app. For more, see AppleInsider's hands-on impressions. Adobe Ink and Adobe Slide are available through Adobe.com for $199.99.